The piece is played here by a trio of musicians (Amy Hiraga, violin; Peter Wyrick, cello; and Marc Shapiro, piano), all with notable credentials, and all currently members of the San Francisco Symphony. Kees Hülsmann, who premiered the work (Atlantic Crossing), must surely know the solo violin part inside out. He is a fine artist with a distinguished career and reputation, and I have to assume that his performance of the piece here is beyond question. 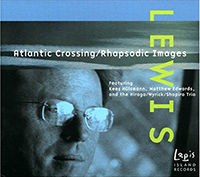 Atlantic Crossing is Peter Scott Lewis’ 2002 violin and piano version of his 1996 Violin Concerto, originally premiered in Rotterdam by the violinist on this recording, Kees Hülsmann. Cast in four movements, with an extended Lisztian introduction, it’s a work who myriad stylistic points of reference are negotiated here with chameleon-like ease. Late Delian chromaticism colours the more reflective passages of the first movement (An Awakening/Bright Morning! ), while the dramatic opening of the finale (Arrival) initially pays homage to Stravinsky’s Violin Concerto, yet continues with music of a tonally free, dancing, Bergian intensity. Hülsmann plays with a Ferras-like jewelled accuracy, employing an extraordinary range of bow pressure, speed, and articulation. This is big-personality playing of exquisite subtlety, which ensures that the music’s post-Romantic gesturing emerges as a compelling narrative. Stunning pianism, too, from Matthew Edwards, is ideally complemented by a high-impact yet atmospheric recording. Rhapsodic Images was (unusually) a three-way commission from the Bakken, Raphael and Robert Schumann trios. Completed in July of 1998 and scored for traditional piano trio, it is cast in two movements, the first of which is an extended (18-minute) rhapsody which fluctuates hauntingly between soaring lyricism and rhythmic potency. The four-and-a-half minute Epilogue which rounds out the piece is a separate coda that reflects upon the music heard in the previous movement with heart-warming affection. Amy Hiraga and Peter Wyrick, currently members of the San Francisco Symphony, and pianist Marc Shapiro sound intoxicated by the kaleidoscopic iridescence and sheer verve, effortlessly carrying the listener along with them. For me, this is the contemporary discovery of 2004. San Francisco composer Peter Scott Lewis writes music that deftly balances vibrant dissonance and lyrical, slightly post-minimalist textures. It's smart, intricately crafted, and it makes a willing, even urgent appeal to a listener's sensibilities. The two substantial works on this new CD show Lewis at his most ambitious, and the results are gripping and almost deceptively forthright. "Atlantic Crossing," an arrangement for piano and violin of the composer's Second Violin Concerto, boasts a wealth of strong-limbed melody; the performance, by violinist Kees Hülsmann and pianist Matthew Edwards, is fearless. Also included is "Rhapsodic Images," a freer, more overtly ingratiating trio played with wonderful passion by violinist Amy Hiraga, cellist Peter Wyrick and pianist Marc Shapiro (all of the San Francisco Symphony). Lapis Island Records is distributed by City Hall Record Distribution and The Orchard/Sony Music. Naxos Records, New Albion Records, and Theodore Presser Company publications are widely distributed throughout the world. Please refer to those companies for any additional information.